This page is dedicated to serving as a primer for trainees that are new to the field of interventional radiology (IR). The content on this page can be found throughout the interventional radiology section of this website, however it is also organized here for the sake of convenience. While this page aims to serve as a good primer there are other established resources for IR that complement the content of stepwards.com. The field of Interventional radiology one can be daunting for new trainees given its nuanced nature. This page strives to try and clarify some of the basics (image source). Measurements in interventional radiology can get confusing because needles are measured in GAUGES, wires diameters are measured in INCHES, and other equipment (such as catheters, sheaths, etc) are measured in FRENCH. This page is decanted to discussing this topic in greater detail to provide some clarification on this quirky aspect of interventional radiology. Using Ultrasound For Interventional Radiology Procedures: this is a very large topic however a video series that introduces how to use ultrasound for interventional radiology procedures is linked here. These refer to the start up kits/trays that the technicians will use to prepare for each interventional radiology case. They contain stock items (such as syringes, waste management systems, bowls, towels, etc) that are routinely used during various cases. Custom Waste Management Start Up Tray: this is a more limited kit that can be used for smaller cases. The linked video shows what is included in a kit like this one. As a new trainee it is important to understand that the manner in which people “scrub into” cases is different for most IR procedures. Unlike most surgical specialties for IR cases it is important to be familiar with how to scrub yourself into the case (this essentially involves putting on your gown and gloves by yourself in a sterile fashion). The general workflow for scrubbing into a case involves acquiring your gown/gloves, opening them up, washing your hands, and then carefully putting on your gown, and then using your gown to put on your gloves in a sterile fashion. For more detailed reference please reference the dedicated page on how to scrub yourself into interventional radiology cases which provides instructional videos as well. Filling Syringes (Saline/Contrast): very routinely at the start of the case the empty syringes used for contrast and saline injections will need to be filled. It is important to be familiar with the apparatus used to fill these syringes as it is often times the role of more junior trainees to make sure these syringes stay filled. Please refer to the linked page for a detailed video on how to use the apparatus for filling these syringes as it is a bit nuanced. It involves lines for saline, contrast, and then also a line for flushing syringe contents into a waste collection bag. Flushing Wires: and most any device that has a leur lock compatible port (needles, catheters, dilators, sheaths, etc) will generally be flushed at the start of a case. This includes wires which are packaged in casings that allow for the to be flushed easily. The linked page shows how this can be performed. It is important to realize that there are exceptions to this flushing rule (such as NOT flushing balloon ports on devices such as balloon dilators, drainage tubes with balloon retention devices, etc). Micropuncutre Kit: this kit is used very commonly at the start of the case to gain access. The linked page shows the kit components, how to prepare/flush each item, and then also includes a video on how to actually use the kit itself. Vascular Access Sheath (Percutaneous Sheath Introducer Set): this set is used very commonly at the bringing of a case to establish long term access. The linked page shows the kit components, how to prepare/flush each item, and then also includes a video on how to actually use the kit itself. Multipurpose Drainage Catheter Kit (Dawson-Mueller Drain): This kit is commonly used in interventional radiology to place drains all over the body. It is important to be familiar with the kit components and how the drain works (which is discussed on the linked page/videos). 3-Way Stopcock: while a simple device, its usage can be tricky for new trainees. The linked page provides a video which shows clearly how to use the 3-way stopcock to avoid unnecessary spills. Torque Device: This is a very commonly used piece of equipment that is often times used with wires to direct and twist the wire (i.e. torque the wire). Tuohy-Borst Adapter: A Tuohy-Borst Adapter is a nuanced piece of equipment. It is important to understand how it works, and the linked page provides a video showing how to use the adapter with a microcatheter. Chest Port Kit: This kit (and others similar to it) is commonly used in interventional radiology to establish long term access in patients that require long term infusions. The linked page provides a video that goes over what is included in this kit and how to prepare the port for usage before the start of a case. Hemodialysis Catheter Kit (Tunneled Dialysis Line): This kit is commonly used in interventional radiology to establish long term dialysis access in patients that are hemodialysis dependent. The associated link goes over an example kit and explains how to prepare this catheter prior to is usage. Gastrointestinal Anchor Set (T-Fasteners/T-Pexy Devices): This set is commonly used in interventional radiology when placing a percutaneous gastric tube (PEG tube). The associated link goes over an example kit, shows how to place the fasteners, and then also discusses their removal as well. Microcatheter Set: Microcatheters can be a bit difficult to handle at first, however if you understand how the system works it is much less daunting. The linked video goes into great detail about how to use the microcatheter system. Microsnare Kit: Not the most commonly used piece of equipment, however snare systems (both micro and non micro) are a bit nuanced and benefit from having some clarification provided on how the kits are used. View the associated page to learn more about snares. Administering Lidocaine Properly: administering lidocaine will be the first time that the patient’s skin is punctured. It is an opportunity to help control the patient’s pain and discomfort, however if not administered properly can lead to unnecessary pain and rattle the confidence of new trainees. It is a simple task but is nuanced. As a result look over the linked page (and the associated videos) to learn more about this topic. Unsheathing/Re-sheathing The Scalpel: Unsheathing/re-sheathing the scalpel properly is an important component of handling sharps appropriately. While not a complicated technique, it is important to know. Straightening The Tip Of A J Wire: While a simple concept, understanding how to straighten the tip of a J wire is not completely intuitive. The linked video below shows how this is done (and it is important to note that this skill can be applied to other similar wires). How To Gather A Wire: it may not seem like such a huge topic, however as things speed up during a case it is important to be skilled in how to gather a wire quickly and effectively without compromising the integrity of the wire or its sterility. Observe the linked page which includes a video on this topic. Re-sheathing Wires (Placing Them Back In Their Packaging/Casing): it will depend on the situation however sometimes it is advantageous to put a wire back in the casing it was packaged in. The linked page offers more on this topic. Loading Equipment Onto The Wire: it can be tricky loading small devices onto thin wires given that the wire will need to be threaded through very small holes. Small technical considerations discussed in the linked page/video can help make this skill second nature. Mainly using ones finger on the back end of the wire as a scaffold for loading things onto the wire is useful. Advancing Equipment Over The Wire (Pinch/Push Technique): it is very critical to avoid moving the wire when advancing equipment over the wire. It is dangerous for the wire to move forward without knowledge of the interventional radiologist. Similarity if the wire moves back access into a specific anatomical space may be lost unnecessarily. It is for this reason that a pinch/push technique is implemented which involves pinching the wire and pushing the device that is being advanced to ensure that the wire does not move. The linked page/video helps demonstrate this technique. Removing Equipment Off The Wire (Pinch/Pull Technique): it is very critical to avoid moving the wire when removing equipment off the wire. It is dangerous for the wire to move forward without knowledge of the interventional radiologist. Similarity if the wire moves back access into a specific anatomical space may be lost unnecessarily. It is for this reason that a pinch/pull technique is implemented which involves pinching the wire and pulling the device that is being removed to ensure that the wire does not move. The linked page/video helps demonstrate this technique. Securing The Back End Of The Wire (Anchoring The Wire): often times it is useful to secure the back end of the wire to make sure that it does not move. The wire is pinched and then ideally the anchoring hand is rested on stable surface. The linked page/video demonstrates this technique. Closing AV Graft/Fistula Access Sites (Purse String And Toggle Technique): when accessing AV grafts/fistulas it is important to realize that they are high pressure systems. The linked page shows one technique to close these access sites using a a purse string suture as well as a “toggle” device (cut piece of a dilator/introducer) to securely close down the access site. The link also discusses how to remove these toggle devices after they no longer are needed. Closing Femoral Artery Access Sites (Angio-Seal Vascular Closure Device): the linked device is one used very commonly to close femoral artery access sites. The linked page explains how the kit works and how to use it properly during a case. 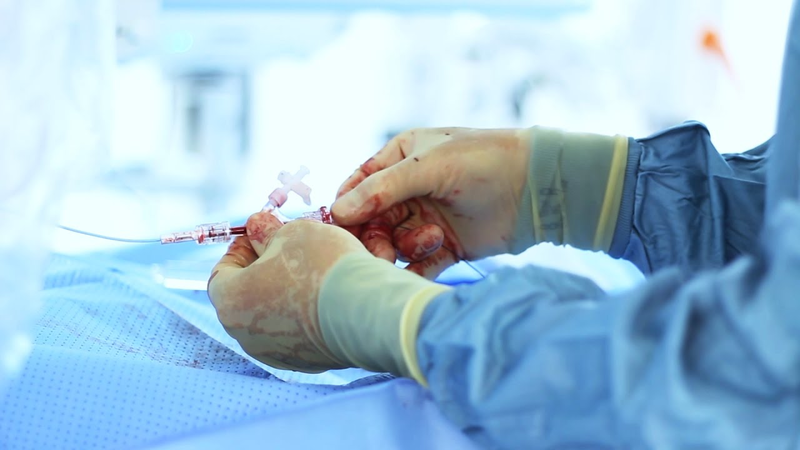 Closing Radial Artery Access Sites (TR Band Radial Artery Compression Device): this is a device that is used to apply compression to a radial artery access site at the end of a case. The linked page shows what is included in the kit, how to use it, and then how to remove the device when it is no longer needed. Suturing Tubes In Place: There are various ways to suture tubes in place to secure them. Some of this techniques are shown in videos on the linked page. Regardless of the method used, it is important to find a system where you can secure a tube in place so that it is not removed by accident. Suturing Lines In Place: There are a number of techniques that can be sued to secure lines in place (such as tunneled catchers, etc) after they have been placed. The associated link shows a variety of these techniques. Securing Tubes/Lines With The Statlock Device: Statlock devices are often times included with various kits to secure lines/tubes to the skin of a patient. The linked page shows how to use this device. Dressing Puncture Sites (2×2 Gauze With Tegaderm): this is perhaps the most commonly applied dressing given that most all IR cases will have some type of puncture site (which are commonly covered in the fashion shown on the linked page/video). Often times many fo the devices, equipment, lines, and/or tubes that are placed in the field of IR are not meant to be used indefinitely (or the patient reaches a point in their care where these items are no longer indicated). As a result, it is important to be familiar with the proper removal of IR equipment. Removing Secured Drains/Tubes From The Patient (Ex: Abdominal Drain): drainage catheters (such as abdominal drains) will have to be removed after they no longer needed. The techniques used to remove a secured drain/tube is shown in the lined page/video. Removing IR Chest Tubes (Pigtail Catheters): Once an IR placed chest tube is ready to be removed there are a number of ways that this task can be performed. The associated link/video shows this technique.